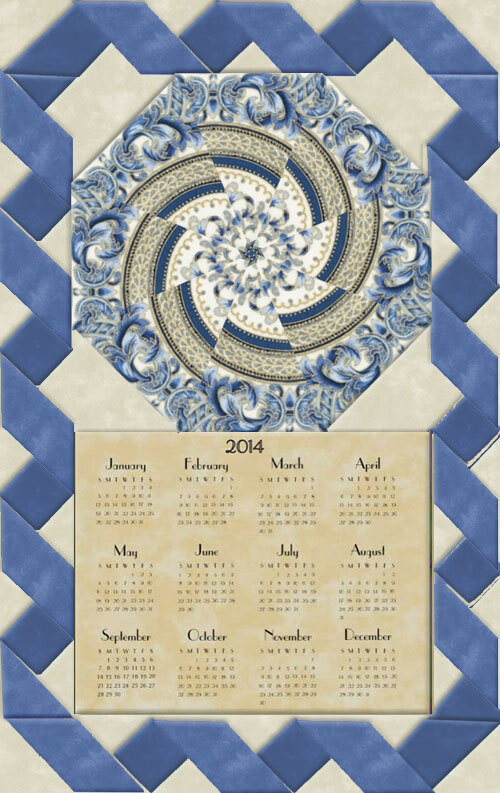 Florentine 4 Calendar Wall Hanging Kit. Kaleidoscope cut from Florentine 4 Medallion by Peggy Toole for Robert Kaufman Fabrics Journey to the gilded opulence of Florence,Tuscany with Peggy Toole in Florentine 4. A rich design and layered colors make simply beautiful kaleidoscope blocks. Colors are all blues and white. This includes the illustrated instructions to make this Wall Hanging as well as a preprinted 8 1/2 by 6 3/4 inch muslin insert with the calendar printed on it. The finished size of the Wall Hanging is approximately 11 by 17 1/2 inches. Block and 3 fat quarters included.